C'mon is primed and ready for play time, dance time, anytime with its serious beats, honey sweet hooks and shimmering harmonies. 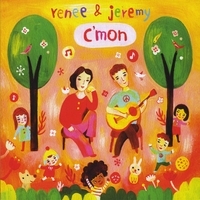 "Renee & Jeremy’s C’Mon delivers upbeat tempos, lush harmonies, and lyrics that capture the tenderness of a family’s heart." "...As grown-up-friendly as they are, Renee & Jeremy's riffy guitars and sweetly smooth vocals make their songs just as enjoyable to kids who are not yet old enough to realize that LMNO isn't one letter...these songs are for everybody." "For your listening pleasure, we’ll be blasting Renee & Jeremy’s just-released C’mon. Even parents can’t get enough of the L.A. duo’s alterna-pop layered with guitar, drum machine, and joyful vocals." "Renee and Jeremy have helped me fall in love with this genre all over again. "C'Mon" is a wonderful example of the lushness and beauty available in kid's music. My kids love it, my wife loves it and I love it. C'mon and buy "C'Mon" now." "C’mon touches on familiar themes such as patience (”Right Now”), sharing (”Share”), and familial love (”Mama Papa Love”), but it does so with uncommon intelligence and grace. In a crowded kids’ music marketplace where hyperactive noise is often overpowering, Renee & Jeremy keep things simple, contemplative, and honest. This album will be a gift for you as much as it is for your children."